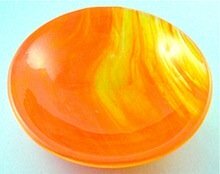 This fused glass bowl is made from one piece of orange Bullseye Streaky, and one piece of clear Bullseye glass, fused and slumped in a glass fusing kiln. This bowl is made from one piece of Orange Bullseye Streaky, and one piece of clear Bullseye fusing glass. Firstly, the layers are cut into circles, fully fused and then slumped into a mold. A five inch diameter slumping mold is used for this project. It is a matter of choice which size is used. One piece of orange Bullseye Streaky and one piece of clear glass. Step 1. Cut one circle from each piece of glass. Step 2. Clean and dry circles completely, place streaky layer on top of clear circle and put on prepared kiln shelf. Step 3. Load shelf into kiln. Step 4. Use this schedule to fuse bowl. The annealing stage has been removed as the bowl will be annealed during the slumping process. If fusing larger circles then it may need to be adjusted. Step 5. When the item has cooled to room temperature remove from kiln. Step 6. Apply four or five coats of kiln wash to slumping mold. Make sure that any air holes in mold are not blocked with wash. Step 7. Sit fused circles in slumping mold and place in kiln. Step 8. Use the following slumping schedule, an annealing segment has been added for this stage of the process. Step 9. When project has cooled to room temperature remove from kiln. The bowl should be nicely formed with clear segments showing through parts of the streaky glass.